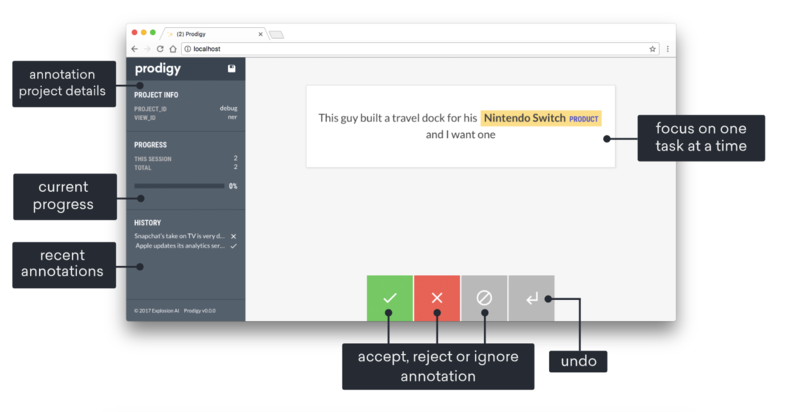 Prodigy is an annotation tool so efficient that data scientists can do the annotation themselves, enabling a new level of rapid iteration. Whether you're working on entity recognition, intent detection or image classification, Prodigy can help you train and evaluate your models faster. Stream in your own examples or real-world data from live APIs, update your model in real-time and chain models together to build more complex systems. prodigy dataset ner_product "Improve PRODUCT on Reddit data"